Ok so everybody knows Picasso. Somehow history has made something of a “god” out Picasso, not that he wasn’t an innovative pioneer of the modern art movement or anything, but was he really all that better than his contemporaries? I suggest that Picasso was no better or worse an artist than his good friend Georges Braque, whose work I just so happen to prefer. Now I know you are probably wondering who George Braque is, and if you think you know him, than you only know the part of his collective works that are relevant to Picasso. But Braque was just as radical to the early 1900’s art scene as Picasso, and he shook the traditional methods of art creation just as fiercely. Most biographies on Braque begin with his friendship to Picasso and how together their collaborative efforts produced Cubism, one of the most shocking and polarizing styles to ever be invented. But Braque was an established painter in his own right before he ever met Picasso. Braque began as a house painter and decorator in his hometown in Le Havre. During the evenings he studied painting as the École des Beaux-Arts from about 1897 to 1899. In Paris, he apprenticed with a decorator and was awarded his certificate in 1902. But the next year he met Marie Laurencin and Francis Picabia (Impressionists) attending the Académie Humbert, also in Paris, and began to experiment with Impressionism. As such, Braque’s earliest paintings are soft and textural studies of light and shape and these are elements that would always be singular to his paintings even after he and Picasso later try to paint so similarly that no one could tell who painted which canvas. In 1905 the Fauves (Beast) debuted their work in Paris. When Braque saw the show he began to experiment with this new style that used brilliant colors to represent emotional response. Braque worked closely with Raoul Dufy and Othon Friesz, who shared Braque’s hometown of Le Havre, to develop a somewhat more subdued Fauvist style more in touch with his Impressionist roots. In May 1907, Braque successfully exhibited works of the Fauve style at the Salon des Indépendants; a very controversial series of art shows that scoffed at the “stuffy” academia conventions used to judge art choosing the device “No jury nor awards” (Sans jury ni récompense). 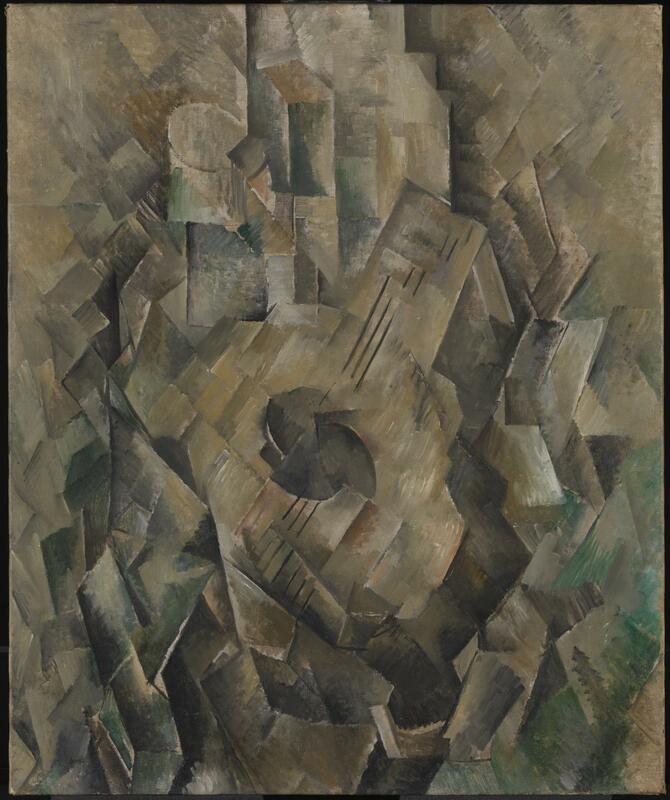 The same year, Braque’s style began a slow evolution as he became influenced by Paul Cézanne, who had died the year before. No doubt Braque saw Cezanne’s work when they were exhibited in Paris for the first time in a large-scale, museum-like retrospective in September 1907 at the Salon d’Automne. This exhibit would greatly affect the avant-garde artists of Paris, foreshadowing the advent of Cubism. 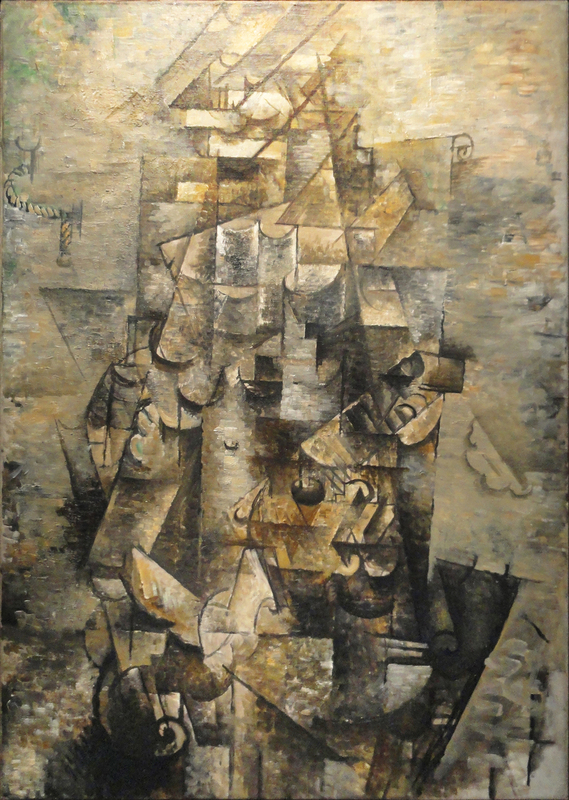 But the collaboration did not diminish Braque’s unique contributions to Cubism, and as history reminds us certainly did not tarnish Picasso’s popularity. Though there are similarities in their paintings and other works, there are differences also. A comparison of a series of works over the years the artists worked together and after reveals that the effect of Braque’s encounter with Picasso accelerated and intensified his exploration of Cézanne’s ideas, rather than to divert his thinking in any essential way. 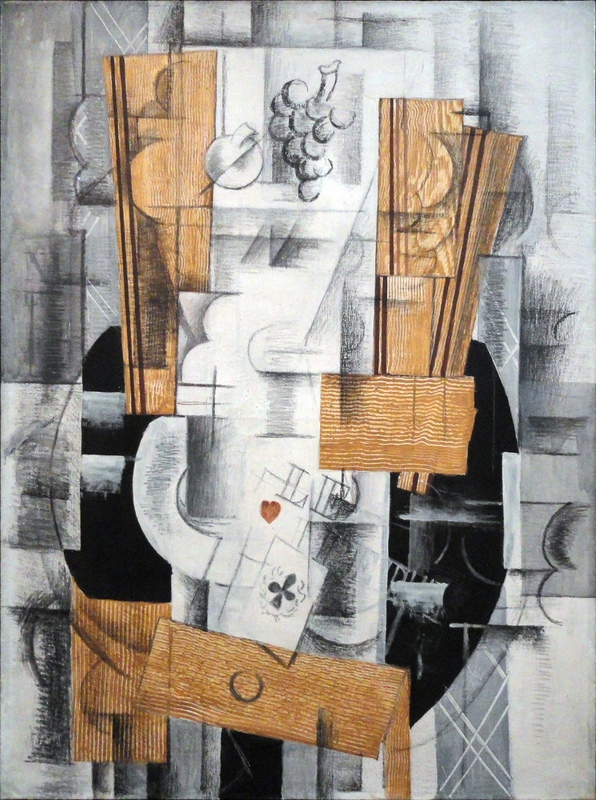 Braque’s main subjects are still-lives in which he abstracts the perspective and color of musical instruments, stairs, fruit, architecture, and other traditional subjects. In these paintings Braque is still clinging to Impressionist and Fauvist style of light and shape, color and form, thought and emotion. Picasso, who was greatly inspired by Gauguin, African Masks and Iberian sculpture, used the Cubism method to abstract people, movement and action. A great way to distinguish the two artists is to consider that Picasso celebrates animation, while Braque celebrates contemplation. So yes, in the early 20th century, Georges Braque and Pablo Picasso invented Cubism and shook the foundations of Western art. But Braque’s story did not begin with Picasso, nor does it end with him. In 1914 Braque enlisted with the French Army to fight in WWI, ending his partnership with Picasso and his painting endeavors for a time. In May 1915, Braque received a severe head injury in battle at Carency and suffered temporary blindness, requiring a long period of recuperation. In 1916 Braque resumed painting, alone and he began to moderate the harsh abstraction of Cubism. He developed a more personal style characterized by brilliant color, textured surfaces, and—after his relocation to the Normandy seacoast—the reappearance of the human figure. But, he painted many still-life subjects during this time, maintaining his emphasis on structure. He is quoted saying that he is drawn to sell-lifes “because in the still-life you havea tactile, I might almost say a manual space… This answered to the hankering I have always had to touch things and not merely see them… In tactile space you measure the distance separating you from the object, whereas in visual space you measure the distance separating things from each other. This is what led me, long ago, from landscape to still-life.” His devotion to still-life subjects gave an introvered meditation feel to his works after the war that was criticsed sometimes for not being political enough. In the 1930s the rise of fascism brought new urgency to questions of aesthetics and politics, and art critics want to art that spoke to reactions from the war. Picasso’s Guernica (1937) seeks to find a resolution to questions that entered mainstream consciousness and it is works like this that perhaps satisfied critics’ need for sensationalize and thus gave Picasso leverage in publicity and fame. Braque’s fractured still lifes and bourgeois interiors remained emphatically inward-looking as Picasso work became more and more controversial for political subject matter that proved to sell more news papers and art shows than Braque quieter abstract of method and form. I find it odd that it would be Picasso that turned into the political artist when it was Braque that served in the war, but is a matter for another post. Braque died on August 31, 1963, in Paris. He is buried in the cemetery of the Church of St. Valery in Varengeville-sur-Mer, Normandy, whose windows he designed. The artist had continued to work during the remainder of his life, producing a considerable number of paintings, graphics, and sculptures. In his last years, Braque worked with prints and lithographs with Fernand Mourlot (who he introduced to Picasso) and most of the book illustrations he created during the 1940’s and ’50s were produced at the Mourlot Studios. In 1962, a year before his death, Braque was still working and collaborating to make new innovations in art, this time with master printmaker Aldo Crommelynck. His last works are a series of etchings and aquatints titled “L’Ordre des Oiseaux” (“The Order of Birds”) which was accompanied by the poet Saint-John Perse’s text. These prints are dreamlike and are praised for honoring truisms related to birds as spiritual and sacred. And here’s the rest of the stuff I looked at.